Thank you to Lenka Cathersides for this research. Although Frank French appears on the South Street Memorial – we can find no link to Dorking. Frank Ainger French was born in the 2nd quarter of 1895 in Paddington, London to Charles William French born about 1862 in Marylebone, Middlesex and Ellen French nee Whatling born abt 1860 in Denham, Suffolk. The couple married in the 3rd quarter of 1890 in Marylebone, Middlesex. 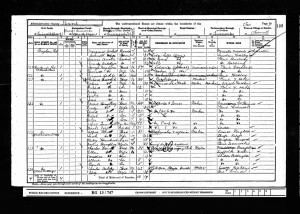 Frank had five siblings but one had died by the time of the 1911 Census: Nellie Constance born about 1892 in Paddington, London; Albert Edward born about 1893 in Paddington, London; Charles Leonard Ingram born about 1902 in Sevenoaks, Kent and Florence Norah born about 1907 in Sevenoaks, Kent. During the 1901 Census the family lived at 2 Catherine Villa, Hartslands Rd, Sevenoaks and Frank’s father Charles was working as a building managing clerk. 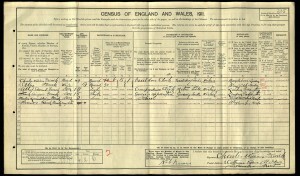 At the time of the 1911 Census the family still lived at 2 Catherine Villa, Hartslands Rd, St Johns, Sevenoaks. Frank’s father was working as a builder’s clerk and his brother Albert as a correspondence clerk in the motor trade. Frank himself was working as a grocer’s apprentice. The villa had six rooms. Frank enlisted in Bedford, Bedfordshire. 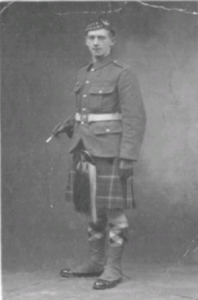 He was the part of the 4th Seaforth Highlanders (Ross-shire Buffs). He became a Lance Corporal with a regimental number 2474. 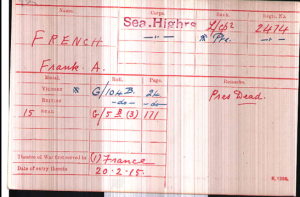 Frank disembarked in France on the 20th of Feb 1915. He was killed in action in France. The exact day of his death is not known. 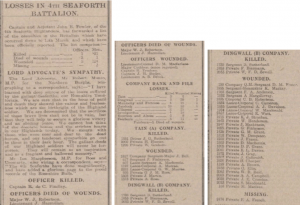 Frank went missing and is presumed to have died on or since the 11th of Mar 1915. 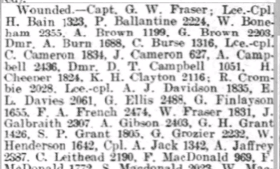 He was likely killed during the battle of Neuve Chapelle (10 to 12 Mar 1915) which was a village in France where the 4th Seaforth Highlanders suffered great losses. He is commemorated at Le Touret Memorial, France on panels 38-39. Frank left to his father Charles William soldiers effects of £3, 15s, 9d on the 20th of Jun 1916 and his father received a further £3 on a later date. Frank’s name is engraved on the South Street Memorial, St. Martin’s Church Memorial and he received the British, Victory and the 1915 Star.